It turned out to be a problem. A simple easy card holder was a total failure. And I didn’t have an ideas to resolve it. Life gets in the way, an new chronic illness and she was busy moving, so I was given too much license to procrastinate. The longer I procrastinated, the harder it was to go up and make a new card holder. 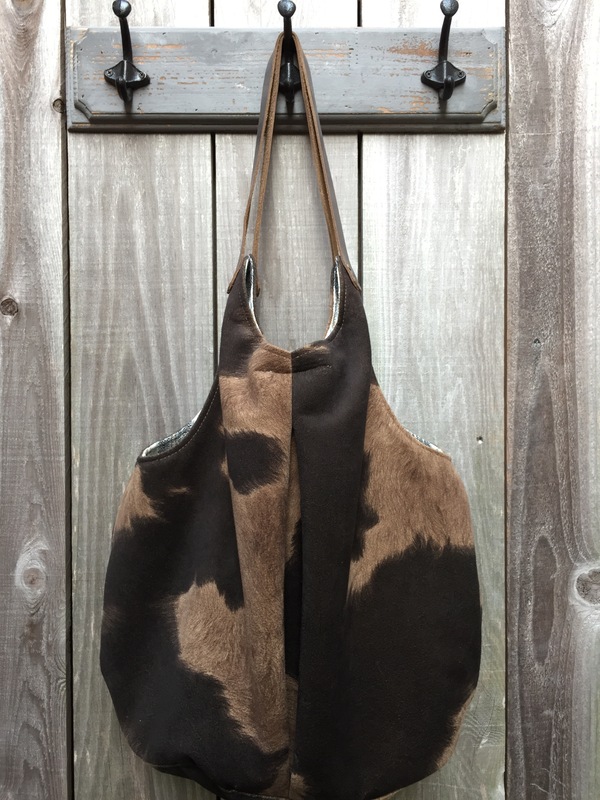 I did finished the hobo bag. Made some significant changes in the design (added hidden magnet closure, moved the pleats at the bottom, & simplified the straps). Very happy with it. I may have to make a smaller one for myself. Then the card holder. It was done in 20 minutes and 3 months. I don’t know why fear gripped me. The solution was so simple. This entry was posted in Zigzagging on February 26, 2016 by slantedstitches. 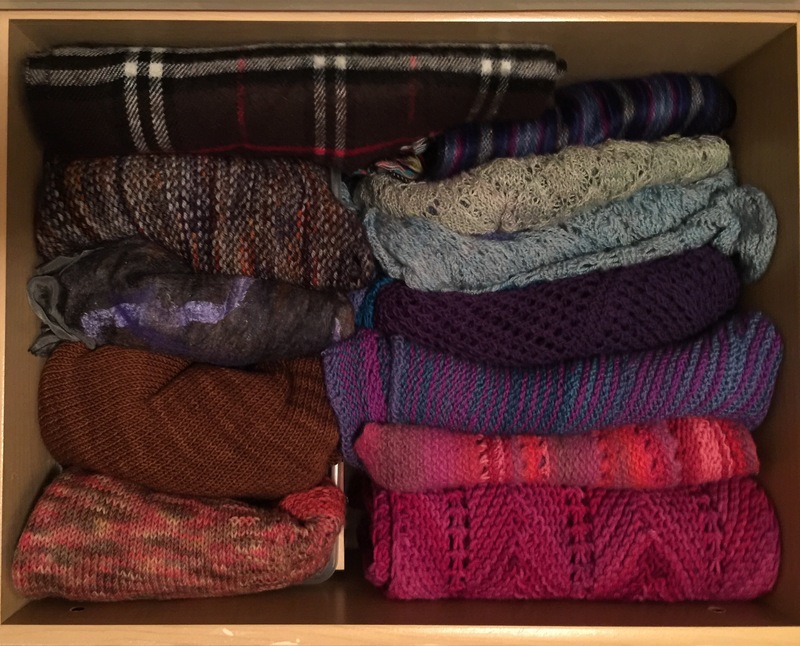 Last week I published & then deleted a post about using the KonMari idea for my digital life. I was premature in that posting. I’m still not sure I’m ready to publish this. But here goes…. I thought the trip to Baltimore would be the ideal time to work on digital stuff. Unfortunately, I broken the first guideline of the KonMari method to gather EVERYTHING together to do the sorting. I completely forgot about my previous digital life before smart phones, an old laptop and really old Mac. The Mac is so old, Apple refuses to let me even bring it in to the store. “We no longer have parts for this, so we can not be responsible for anything that could happen while in our possession.” And I haven’t even turned them on since I got this phone. AND the real failure was forgetting that my digital life was more about memories. Marie Kondo’s mandate saving mementos for last. Maybe I’ll update in a few months…when I can face those memories. On a better note, others have been thinking the same thing about cleaning up their digital life. Note To Self, an WNYC podcast, ran a week long experience called Infomagical. Their focus was on more about returning our smart phones back into a resource & tool for instead of the time waster it has become. This episode, Infomagical Challenge 2: Magical Phone, does a bit of the KonMari decluttering of apps on your phone. Of course I took it too far. I heard more on another podcast. So sorry, I can’t find that episode or which podcast. I might have unsubscribed prematurely. Oops. Yet another fail. Ok, now I’m feeling desperate to find that podcast. 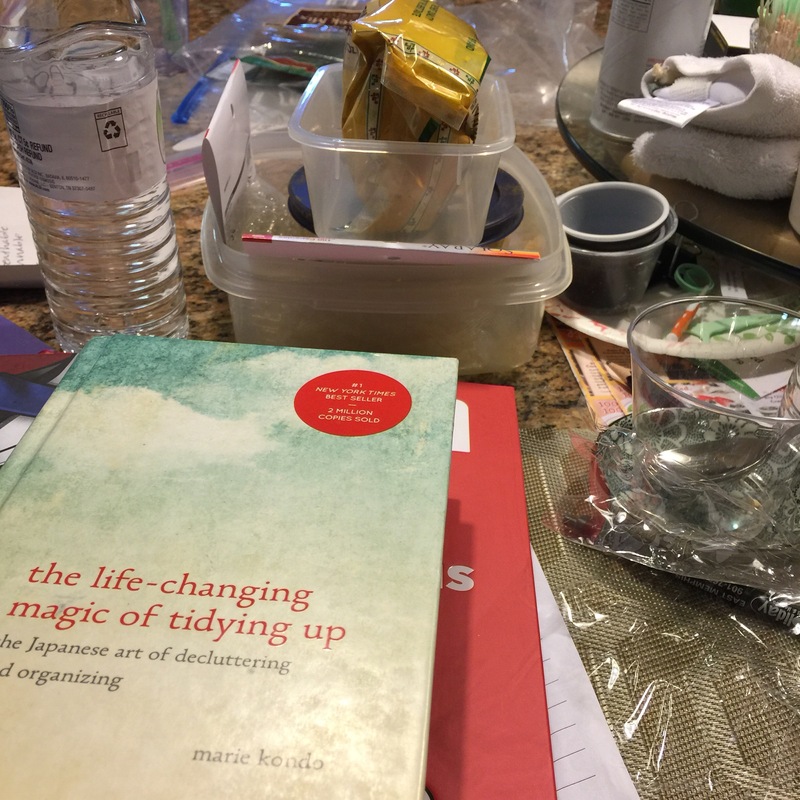 Searching ‘konmari digital clutter’….the main discovery, I’m late to this whole project. Still can’t find that podcart. I did find a extensive interview on GoodReads. Turns out my first fail was bogus & was an overreach of the method. Marie suggests gathering all RELATED FILES/documents/photographs into ONE folder, like the last family reunion. Keep the best of theses. Should have researched more before starting this. Sigh…More work to do. Chat with you next week. This entry was posted in Zigzagging and tagged KonMari, tidying on February 22, 2016 by slantedstitches. I’ve checked, the hotel is in the suburbs, not walking distance or public transit to museums, interesting events, yarn shops, or farmers markets. We are surrounded by shopping malls. I’ll keep up the ‘Spark Joy’ momentum, tackling my digital clutter. Oops, forgot it’s Chinese New Year. Hubby didn’t want to trek to New York or DC (can’t interfere with Super Bowl time). A smaller celebration at the Walters Art Museum is just the ticket. 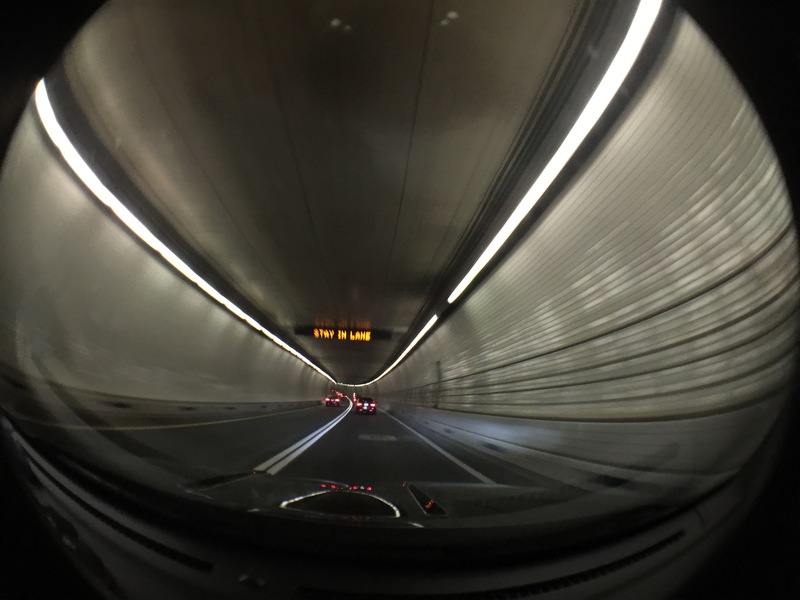 Normally, I wouldn’t make the effort to go downtown (paying for tolls, parking, & lunch). But a few months ago, I watched a wonderful long running PBS program called, Craft In America. 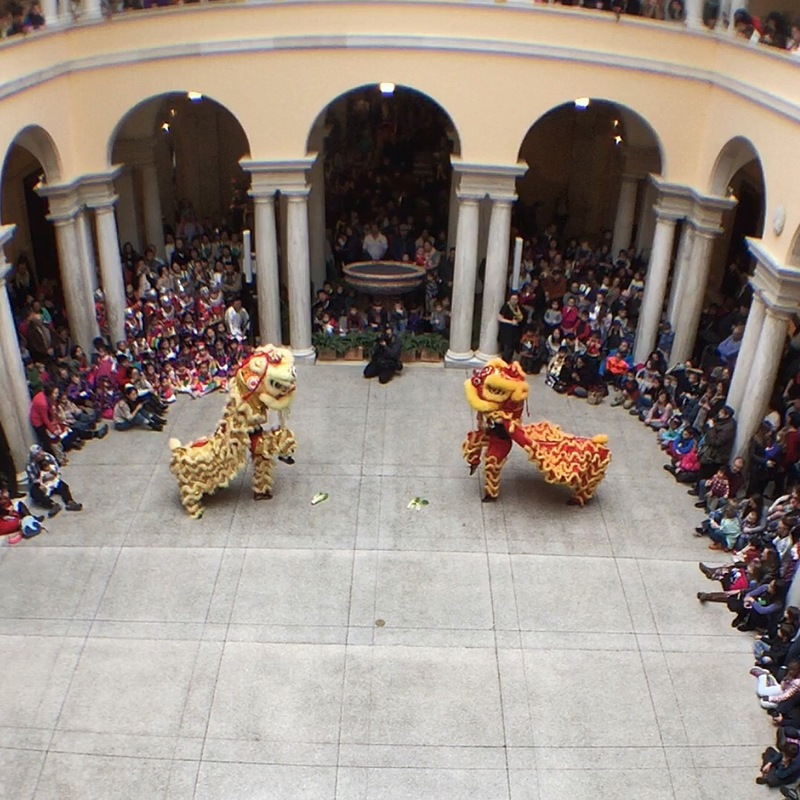 Celebration featured one group of Chinese lion dancers. I had a new appreciation for their dedication & craft. This was my first time seeing a live dance. Impressive 9 minutes performed by university students. 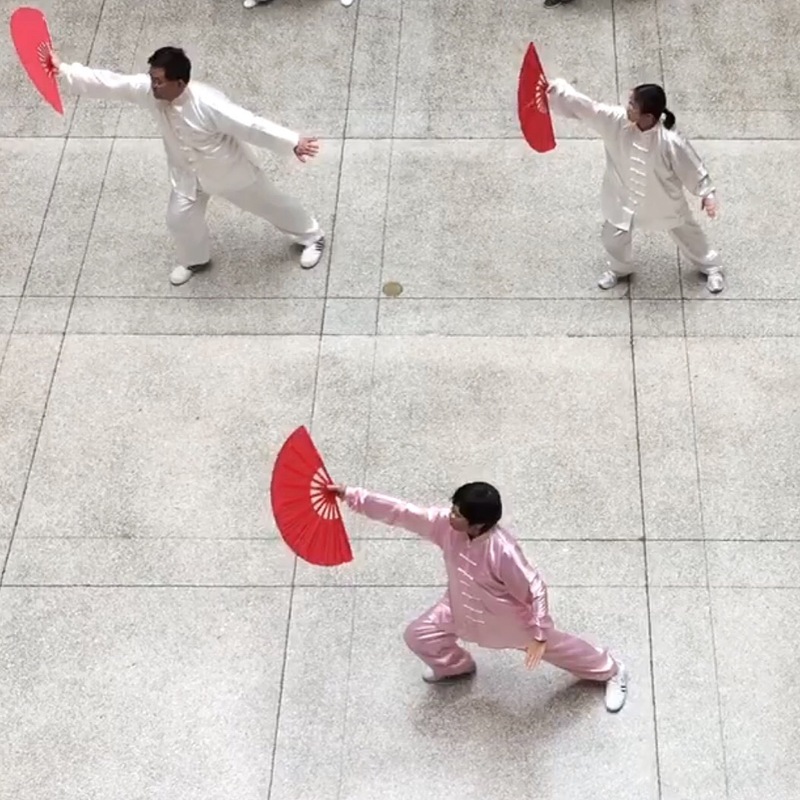 If you want more, here’s a video of Shanghai Spring a Festival elaborate lion dance, posted on The Kid Should See This. It was worth the trip downtown. Exploring the historic Mt. Vernon area of Baltimore. Seeing a bit of the beautiful Walters Art Museum. We will be within walking distance an IKEA, & most important a public library. Guess I will be window shopping and reading, to get some walking and fresh air. Oops! I didn’t check the weather just before leaving for this trip. So I found some snow shoes on sale at the mall. Lesson learned, just routinely pack them for future trips. 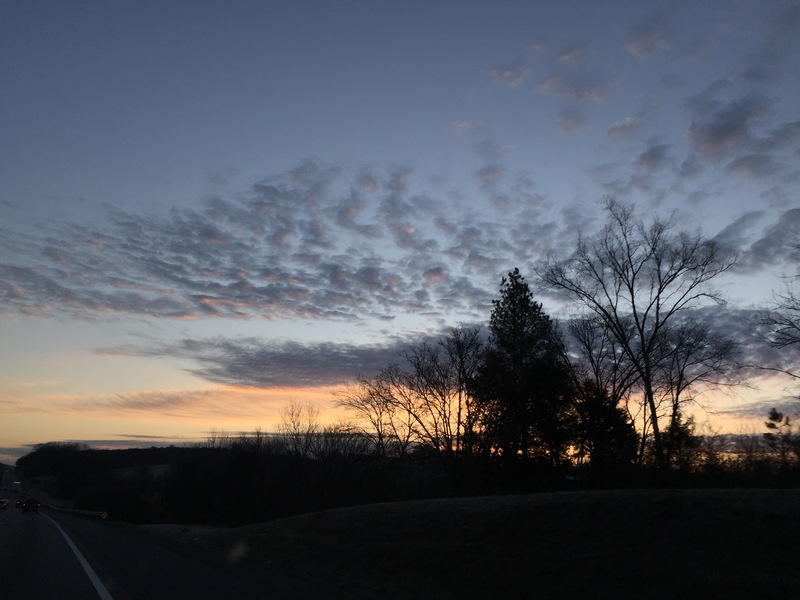 This entry was posted in Road Trip, Zigzagging and tagged road trip on February 12, 2016 by slantedstitches. I didn’t think I need this book. ‘I can figure this out without her help. I would clean, organize, & declutter when guests come & I loved how it feels. But just like an ocean tide, all the floxum and jetsam floats right back on all the horizontal surfaces. It was a constant battle. And much easier to ignore, than deal with it. 5 million copies of Marie Kondo’s first book, ‘The Life-changing Magic of Tidying Up’ have been sold. Ok, maybe she’s got some tips I could use. My copy came through a 4 week old reserve request at the local library. Hey, I knew her focus was on elimination. So why buy the book, to then get rid of it? All that to say I have a two week check out time limit to read and start implementing the process. I can see a lot of rolled eyes and shaking heads of my knitting friends. Y’all probably think I’ve crossed to the other side. All I know that the chaos in my house makes me a bit crazy. But I also reserve the right to not touch my yarn/fiber/fabric stash until I am good and ready. The book is an easy read. A lot makes sense. It comes from a different angle than what you would find on Pinterest where ‘Organize’ equals clever storage solutions. Her focus is on elimination, keep only what ‘sparks joy.’ What you decide to keep are things you cherish and enjoy. She doesn’t care if you divide into giveaway or toss. It’s more about clearing out the psychological/emotional reasons for keeping stuff. You are really clearing away all the old decisions, indecisions, all the if-onlys, the what-ifs or the just-in-cases. They have done their job and it’s time for them to move on. I had two A-Ha moments. One of the first exercises she goes through before, ask what I want the house to be and why and why and why. I discovered that my clutter is really a scattered bunch of procrastinated to-dos weighing me down to a catatonic escape into social media. My drugs of choice are Instagram, Pinterest, and Feedly. I will deal with them later. The other was her comment about loungewear. Have the same respect & criteria for your loungewear as your public clothes. Ok, here was my downfall, I had relegated all the wrong color, wrong size, old tattered & stained and no joy stuff to my at-home-no-one-will-see-me-except-hubby loungewear. Other than loungewear, I was already pretty organized with just a few blind spots. Ha! Wrong! A Saturday project with some modifications in the process was all I needed. Ha! Wrong! I’m writing this on Sunday and am about half way through the process. Maybe if I simply stuck with her method of taking every single item and seeing if it sparked joy could have been faster. Instead, I needed to try on everything. Ok, not everything, at least clothes that I wasn’t sure fit. Surprise! I fit into some much loved clothes & found long forgotten things that are now back in circulation. I did 10,000 steps between my bedroom & closet. I eliminated what was too small, too large, didn’t look good and didn’t spark joy. 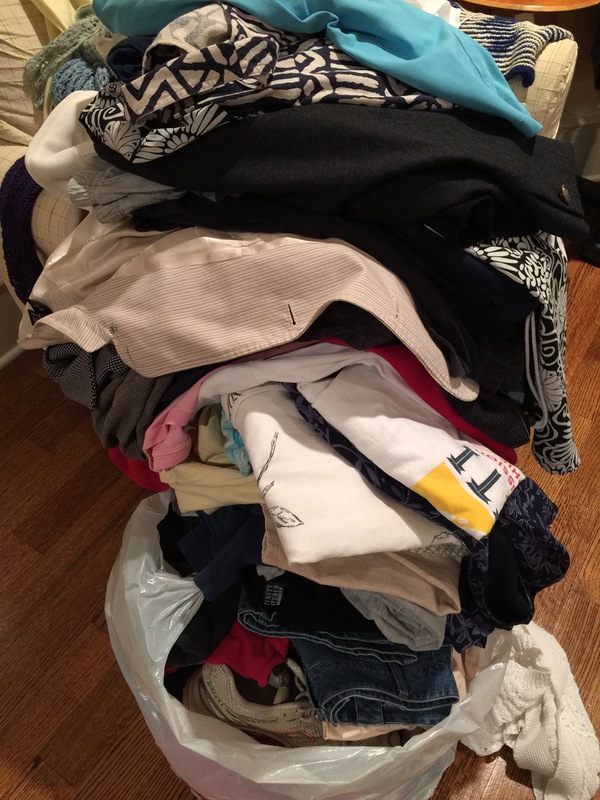 Good bye to sweats, skirts and dresses I wore 30 years ago, hand-me-downs, & never worn. Only pulled two items from the give-away pile. Do you think big shoulder pads will ever come back? I am keeping one favorite big shouldered jacket from the 80s. Really wishful thinking about those big shoulders. I tossed a shoebox full of old shoulder pads. Next, are the accessories, shoes, handbags, shawls, etc. She didn’t specifically talk about shawls or scarves. Her only edict is that everything must be visible and stacked side by side. This drawer makes me very happy to seeing everything at once. But I don’t like rolling them. I have to figure out a better solution. I was a bit lost this morning. There’s no grunge clothes I use to wearing. This will be more of a mental/habitual adjustment than tossing stuff. This entry was posted in Zigzagging and tagged clutter, KonMari, Magic of Tidying on February 1, 2016 by slantedstitches.